It’s not often that customers can make savings with store cards given the high interest rates that come with these cards. But, if used wisely, there are times when customers can actually save money when using store cards. The evidence is overwhelming when it comes to store cards and interest rates. Store cards do come with some of the highest interest rates of any type of credit. As a long term method of paying for goods stores cards are a bad risk. But cautious customers can eliminate the high interest charges by clearing their account balances every month. The stores do of course bank on customers never clearing their balances and simply paying the additional interest. The golden rule with store cards is, if you can’t clear balances don’t use store cards. Store cards are relatively easy to obtain, the downside being interest rates of as much as 30%. But in situations such as Christmas shopping, store cards can allow extra time to spread the cost of purchases. Certain store cards will give up to 56 days to pay before the interest begins on purchases. This can mean that Christmas shoppers can clear their Christmas spending balance using their January salaries and pay no interest. This extra time is beneficial for budgeting money as long as the account can be cleared within the interest free period. Many stores do provide introductory offers to entice customers to open store card accounts. These introductory offers can save a lot of money especially for customers who spend a large amount on that first shopping trip. Introductory offers will usually be a certain percentage off the first spend using the store card. Customers who clear the balance within the interest free period will have made a saving on their purchases. Customers who cannot clear their balance will simply have the introductory savings eaten up in interest charges. Many shoppers have cottoned on to a way to make the most of the introductory store card discounts. 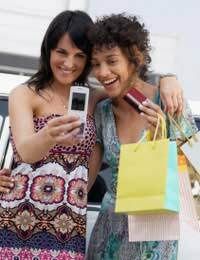 Shopping groups, which are basically groups of friends, have begun taking it in turns to open store cards in order to receive the initial big discounts. They will then purchase goods for everyone in the group and be paid by their friends less the discount amount. This process can be repeated every time a friend opens up a store card. As long as the balance is cleared each time by every account holder the savings can continue. Many stores will have sales throughout the year. Debenhams, one of Britain’s biggest department stores, seems to have a sale every month. Usually sales will occur when the new clothes season begins. Big savings can be made for store card account holders during the sales period. Store card holders will usually be offered additional discounts on top of the normal discounted sales offers. Again, clearing balances before the interest kicks in is a way to avoid having these savings eaten up in interest fees. Many store cards will come with built in reward schemes basically as a way of enticing shoppers to stay loyal and spend money. This will come in the form of an amount of points that can then be converted into cash rewards. These rewards will usually be required to be spent in the store and will bring savings on products. Customers who normally shop within one store regularly can achieve significant savings if they have built up points. Don’t be tempted to buy at the store that supplies rewards if goods can be bought for less money elsewhere. Stick to these rules and it should be possible to save money when spending on store cards. Store cards come with notoriously high interest rates and it is important that account balances are cleared each month. As a long term borrowing option stores cards are probably not a good option for consumers who have trouble sticking to repayments. But if customers can keep to clearing account balances then savings can be made with store cards.